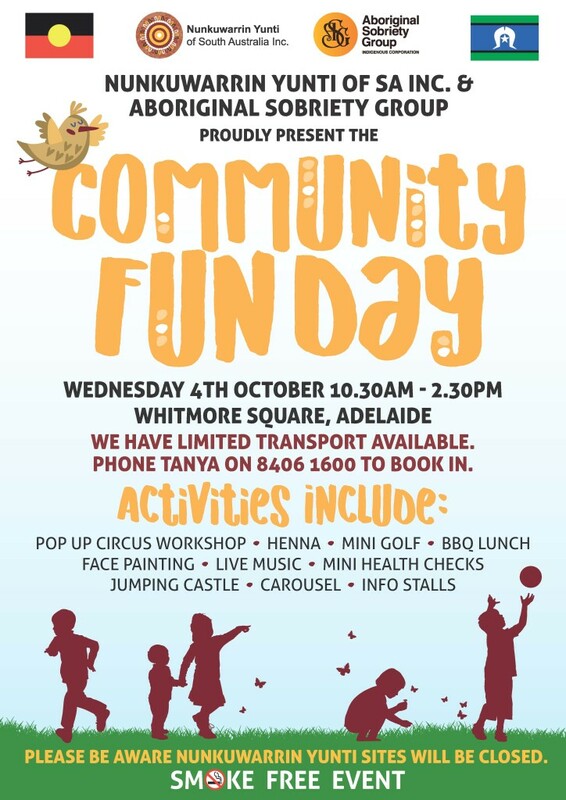 Nunkuwarrin Yunti of SA Inc and Aboriginal Sobriety Group will be holding a Community Fun Day on Wednesday 4th October 2017, 10.30am- 2.30pm at Whitmore Square Adelaide. This will be a fun day filled with musical performances, BBQ lunch and activities such as jumping castle, mini health checks, pop up circus workshop, face painting, henna, mini golf, smoothie bike magician, balloon art and much more. We have limited transport available. To book in contact Tanya on 8406 1600. Please be aware all Nunkuwarrin Yunti sites will be closed on this day.